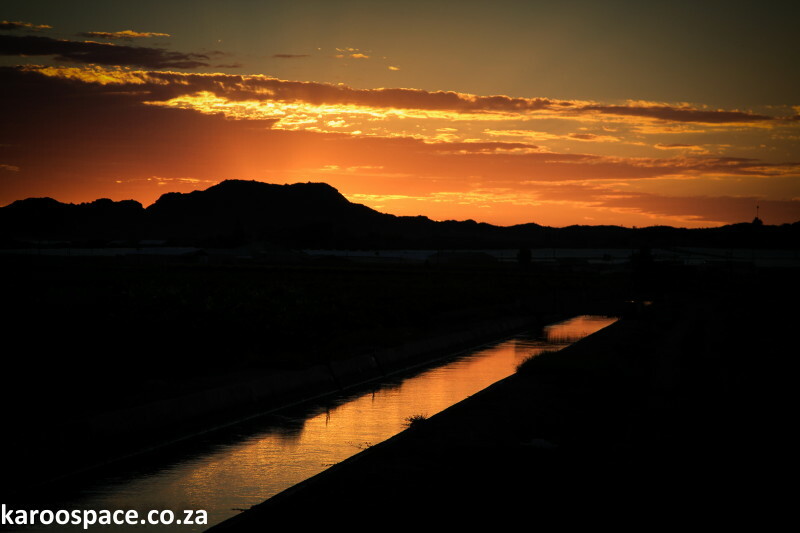 One of the canals leading from the Orange River in the Northern Cape, once the hangout of desperadoes and river pirates. This Gordonia thing has had me mildly flummoxed for years now. Occasionally on the evening news, a weathercaster would flippantly throw out some figures for “the Gordonia area” and leave it at that. I’ve been trying to get more weatherpersons to include my home town of Cradock on their forecast after the economic indicators, but to no avail. And yet they will glibly speak of Gordonia as if it’s Table Mountain and we should all know of it. Invariably, I would ask around: who knows where Gordonia is? Why Gordonia, as such? No one in the bar could say. So I went to find out. Gordonia involves a lengthy tale – as long as the Orange River itself – of pirates and privateers, pacifiers and publicans. And I discovered that if I took the R64 from Kimberley to Upington and beyond, I might well find myself in the middle of Gordonia, that mystical place of sweet grapes and prancing gemsbok. 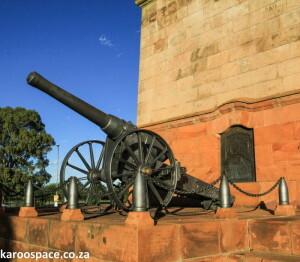 Long Cecil, the famous siege gun named after Cecil John Rhodes. Driving north into Kimberley on the N12 from Jacobsdal, the city resembled a Star Wars movie set in the distance. Surrounding by rich, khaki grassveld, Kimberley shimmered in summer heat and looked like it was about to take off back to its home planet. I mentally time-travelled back to the mid-1870s when Cecil John Rhodes and Barney Barnato first pitched up here in these diamond dustlands. Rhodes was no doubt a fascinating fellow, but over the years my imagination has been captured by the roguish Barney, the cigar-smoking, whisky-chugging, sometime-boxer, sometime-actor, lover of the delectable Fanny Bees and, ultimately a man who became the champion of all Kimberley’s kopje-wallopers in no time at all. Kopje-walloping being, of course, the act of buying up stones directly from the diggers and selling them on. Sort of like a middleman. These days, most of us would love to wallop a middleman if he ever showed his face around here. Barnato, who would probably be a bit of a silicone-chipper today, was a witty and successful operator who discovered early the value of the deep Kimberlite that lay under the dig sites. 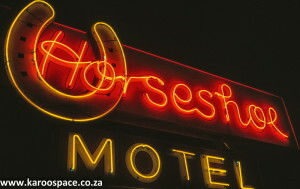 In honour of the adventurous Barney (and because of excellent rates) we checked into the Horseshoe Motel on the southern entrance to the city. There’s no shortage of neon around the Horseshoe Motel, and it evades your normal motel-style tackiness by having clean block chalets with cable TV and a superb supermarket not more than 50 metres away. We spent a whole week in this traveller’s haven, working the sights of Kimberley by day, shopping at the Spar, rigging up our own meals in the room and then falling under the dubious spell of television at night. 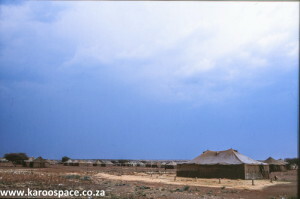 Before the storm – the Schmidtsdrift tented camp. Finally, we had to say goodbye to the Big Hole, the Star of the West pub, Cecil John’s imposing horseback statue, the Gariep Cultural Festival, many museums and war memorials and, obviously, the much-beloved Horseshoe Motel. The R64 was calling, and our first stop was Schmidtsdrift. We drove west out of Kimberley at lunch time, and already the clouds were gathering in a rolling black mass on the horizon, leaving the middle ground sunlit and the sociable weavers’ nests glinting on telephone poles like hairy toffee sticks. This Schmidtsdrift child is now probably a Platfontein adult. The first time I saw Schmidtsdrift was when it was packed with Bushman families from the !Xun and the Khwe tribes, shipped south from the Caprivi Strip after the border wars. Their men had fought on the SA side, mainly as trackers, and there was doubt about their safety in the new Namibia. Now Schmidtsdrift was emptying fast, with most of the 5 000-odd clan members having been moved to Platfontein outside Kimberley. The jury is still out regarding the wisdom of that move. More than 100 kilometres west on the R64, we drove into Griquatown in the vanguard of a massive summer storm. Suddenly, the temperatures went icy and a chill wind ripped through the little town. The child begging outside the Tiger’s Eye Hotel on the main road offered to read us a short poem for the few cents. We gave him a handful of biscuits instead. 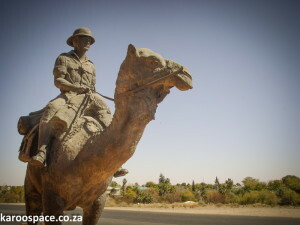 Camel-mounted cops used to chase the bad guys all over the Kalahari. Driving into Upington, we had finally come to the heart of Gordonia. Upington has all the signs of a boom town, mainly because of tourism and mining. 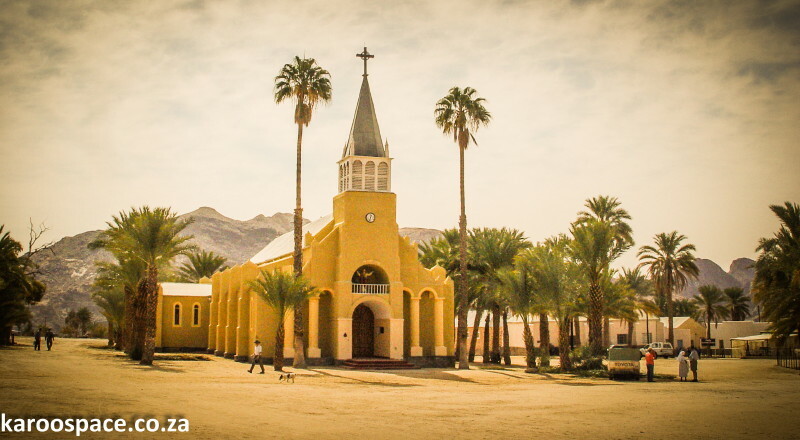 Whether you’re going to the Kgalagadi Transfrontier Park, Namibia, Namaqualand or Cape Town from this region, chances are you’re going to fill up in Upington. More than 115 years ago, pirates used to operate all along the Orange River, causing devastation to farmers and travellers alike. Sir Thomas Upington, Attorney-General of the Cape, took on the river pirates and caught their leader, Klaas Lucas. A town was founded here in his honour. The Prime Minister of the Cape at the time also got his name in lights, courtesy of the river pirates. His name was Gordon Sprigg, and the whole district was called Gordonia. The squirrel who was ordered to go to sleep – and obeyed. Once in the Kgalagadi Transfrontier Park, our first sighting of massed gemsbok (oryx) filling the horizon was followed by an evening parade of jackals, cheetah, ostrich, a pygmy falcon and a caracal cat. Then a Brueghel frieze of golden-lit wildebeest, springbok and a secretary bird, mysteriously tangled in a tree. 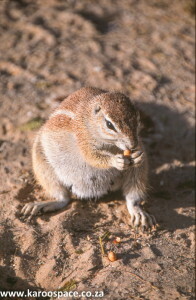 At Nossob Camp, we were mobbed by ground squirrels until I ordered them off to bed like a beleaguered Dr Doolittle. Like a shot, they ducked into their holes nearby and didn’t appear until breakfast the next day. 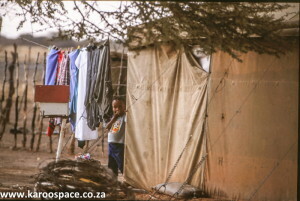 At Mata Mata Camp, the wind was so wild we had to tie our tent onto the braai stand – not too elegant. 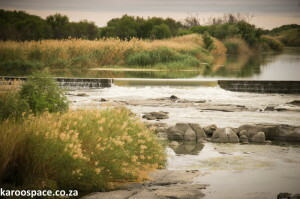 The Orange River between Kakamas and Upington. Swinging back through Upington, we aimed for Kakamas. By now we had a sense of winding backwards and forwards across the mighty Orange River, the Mother Waters of southern Africa. Lonesome donkey on the skyline near Kakamas. We drove to the heart of the Outback of South Africa, a magnificent rockscape of mountains and quiver trees and the soft light of the evening sun glinting off the Orange River in the distance. We spent hours working here with the cameras, and came back at dawn the next day for more. Somewhere on the route we found the sign to Kenhardt, which Jules and I remembered well from 1996 from the madness of the Desert Storm rave out in the vast flatness of Verneukpan, where Sir Malcolm Campbell once tried to break the world land-speed record in his Bluebird. More memories. Last stop on the Gordonia Express was a return visit to the date-palm oasis village of Pella, 30 kilometres west-ish of Pofadder. This is our favourite town in the north, because of the hand-built cathedral, the good-hearted nuns and the utter isolation of the place. 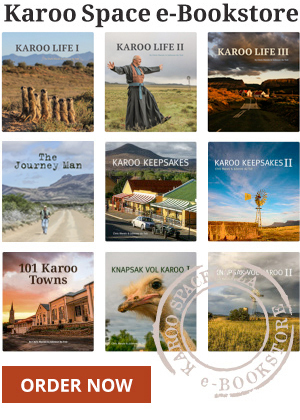 For the best backgrounder on the crossover zone between the Karoo and Kalahari, the SPECIAL OFFER of three Ebooks for the price of Two!